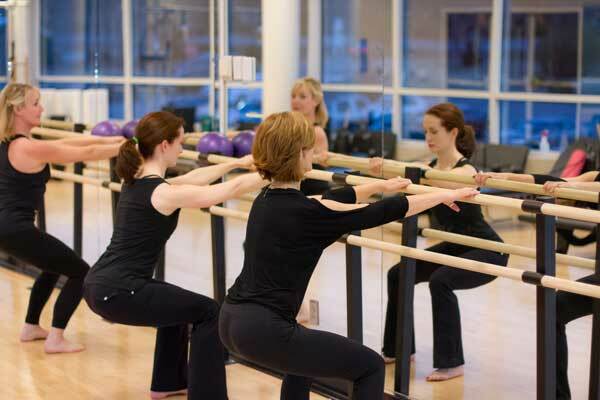 Barre classes offer a great way to stay in shape or improve your fitness level. Barre exercise combines several disciplines, including ballet, yoga, Pilates and functional training to provide an energizing and spirited workout. The exercise style is named after the ballet equipment bar (or, barre) used in ballet training. Unsurprisingly, the technique was first developed in 1959 by a ballet dancer, Lotte Berk, who was recovering from an injury. By combining aspects of her ballet conditioning regimen with her rehabilitative therapy, she created a routine that delivered excellent results and captured the interest of millions of women, including celebrities like Joan Collins and Barbara Streisand. A barre class begins with a warm up and a series of upper-body exercises. The exact routine varies with each instructor, but all are likely to include free weights, planks, push-ups and other moves that target your biceps, triceps, back and chest muscles. You will utilize the barre through a sequence of exercises targeting your thigh and buttocks muscles, as well as your core. Most classes end with cool down stretches that help with flexibility and set the stage for quick muscle recovery. Barre exercise has many benefits, including increased flexibility, muscle definition, weight loss, improved posture and reduced stress. The classes are perfect for women and men of any fitness level. Barre is safe for women during pregnancy, and can even help with balance and stability. The workouts target some of the largest muscles groups in the body, including the glutes and thighs, helping to quickly shed weight and inches. A regular barre regimen of two to four classes per week can produce visible, measurable results in as little as one month. In addition to slimming down, barre can help achieve a greater range of motion and increase your endurance in other athletic activities.